Emerson Drive first hit it big in 2001. It’s been ten years since that first hit in the US and the band is celebrating with a greatest hits package – Decade of Drive . The guys were really talented when they first came out. I remember being a fan of their pop-country music and always kept tabs on their new music even when it wasn’t getting play on the radio. Now the guys have a new single ready for release in the US and it’s something that could have a chance to make a run. Let Your Love Speak is exactly the kind of good pop-country music Emerson Drive fans will love. It’s a great song with a catchy melody. The song brings you in with the melody and the fun lyrics about falling in love make you feel even better as you listen. With summer coming up I think Let Your Love Speak makes for the perfect summer love song. As two people fall in love at the summer beach party or the summer date on the boardwalk this could be their song. 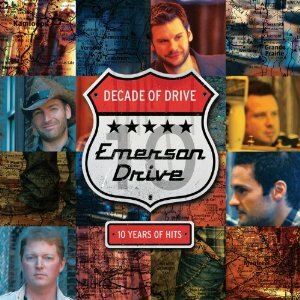 With Emerson Drive they’ve always seemed to find the most success when they just be true to their pop-country roots. The music their fans like is a good mix of country and pop sounds with lyrics about love and life. It’s the stories about life that make people pay attention and combined with the great harmonies and lead vocals it makes for great music like Let Your Love Speak.